Pursuing an MBA is almost always on the long-term plan of any aspiring management professional, and for good reason! A good MBA has the potential to not only exponentially improve your career prospects, but also help you change your job field or take up more advanced managerial roles. Add to this the chance of developing your soft skills and exploring new cultures in a dynamic environment, and one can see the charm a MBA degree holds. Hence it is no surprise that year per year the number of students going for this degree is showing strong growth. This phenomenon though great for the schools, is not so good news for applicants as competition is now tougher than ever. With more and more students world over opting to pursue their education in top management schools in the US and EU, one needs to ensure that every part of his profile as well as his application is top notch. Hence it is no surprise that students tend to start working on their GMAT months in advance, and furiously work on their ESSAYS and LORs perfecting each word to create that splendid application. But, in all the hustle and bustle of focusing on the various parts of the application process, applicants generally tend to ignore (until the last moment) one of the most subtle but important part of application … the Resume!! You may ask is the Resume really that important a part of your application?? The Answer is a resounding YES….Resume is the first stage of communication between you and your dream school, and is the first document they review. As they say first impressions matter, and a good resume should leave a lasting impression on the admission committee. This is especially important as Ad-coms usually scan hundreds of Resumes in one sitting so you get just a minute of their time and hence need to put up a strong front and stand out. Everything from your format and headings to the content presentation should be optimized so that the admission committee can clearly understand your profile and most of your achievements in the limited time frame. Limit your Resume to Single page as it helps the Ad-com to quickly glance through the information provided. Use BOLD AND ITALIC to highlight important points. Keep the font-style and size unique throughout the resume. Avoid informal email-id’s such as “joelrocks07@gmail.com”, it can be taken by the ad-com as a mark of lack of seriousness. Start each bullet sentence with “Action-Words” instead of the regular sentence initiators and conjugators. Always place your work-experience in a chronological order, with the most recent one at the beginning followed by a back-track to your first experience. You can also mention scholarships, rank in competitive or other entrance exams received, and academic honor, if any here. Extracurricular helps you with competitive edge over others with a similar profile but no extracurricular as such. You can mention any Positions of Responsibility held at clubs or any service you provide at any NGO, etc. here. Also, be careful about Active & Passive Voice! Often, the same sentence will convey a stronger message in Active Voice than when written in passive and so on. Craft your MBA Resume keeping the above points in mind and we assure you that you will see a remarkable difference. 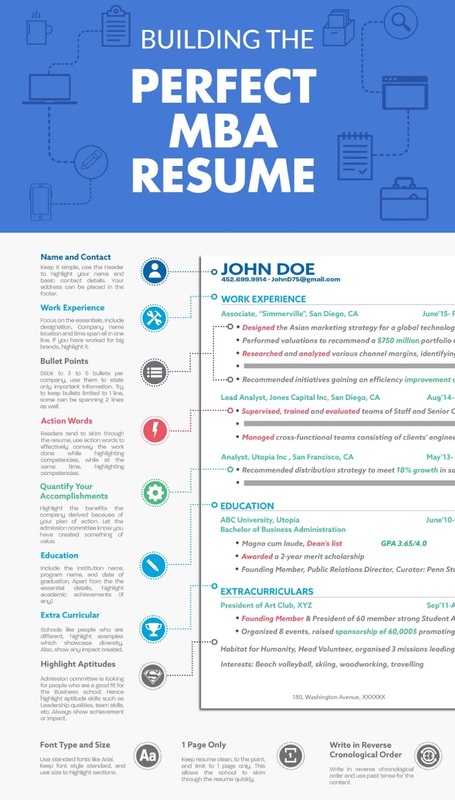 Additionally, we have also designed an infographic to further help you understand the guidelines towards creating the Perfect MBA Resume, check out the infographic below which recaps all the above points with suitable examples. Abhyank Srinet holds a Masters in Management (MiM) degree from ESCP Europe and has an engineering degree with a specialization in Instrumentation & Control. His interest in the digital landscape motivated him to create an online start up for MiM application consulting (MiM-Essay.com), focused on spreading quality information about the MiM degree and performing application consulting services for clients. He is the chief consultant of the company and takes care of Business Development and Digital Marketing side of things. He is very passionate about writing and marketing.